A nice review of my book España de la guerra: the Spanish political and military songs of the war in Spain 1808 to 1814 appeared in Soundboard Scholar no. 4, written by Richard Long. He writes that the book is “a highly original work” and I thank him for that. Indeed, these political songs that are the subject of the book were scarcely known before, as many of their known sources are outside Spain in London, Lisbon, and other places and were previously unexplored. And perhaps most importantly, he writes that my Conclusion suggests some parallels with our own age: that in these songs there was often “a huge discrepancy between the message and the actual facts”, indeed, that the songs are a 200-year-old version of “fake news” . . . “in a pattern that would be repeated many times in the next centuries”. Anyone interested in the nature and mechanisms of propaganda and fake news will find ample and I hope interesting material in my book. I (Brian Jeffery) am giving a talk in Spanish on the songs which are the subject of my recent book España de la guerra: the Spanish political and military songs of the war in Spain 1808 to 1814 at the Universidad de Alcalá in Alcalá de Henares, Aula de Música, on Saturday 27 October 2018 at 20.00. Entry free. I hope that if you will be in Madrid (or can come there) you can come. In the first part of the talk I shall describe these songs scarcely known until now, no doubt because their usually manuscript sources are largely in libraries in London, Lisbon, etc and few in Spain. The principal known composer of these songs was Fernando Sor. Then I shall speak about the political aspect of these anti-French songs, in which I take a view which differs from today’s usual view. The songs were part of the anti-French propaganda of the time, against King Joseph Bonaparte, and their message was usually highly untruthful – indeed, a kind of “fake news” of the time. They are a special kind of propaganda. In the third part of the event performances of some of the songs will take place, and I hope that there can be some audience participation (purely voluntary!) as there was at the time. I have just made available in Tecla as pdfs new editions of two seguidillas by Sor, Si mis ojos te dicen and Yo no sé lo que tiene, from his article “Le Bolero” of 1835, one with a very fast metronome marking from Sor and the other for which he requires rasgueado. Have a look! People have often asked how Tecla Editions began, and where the name Tecla comes from. Here is how it happened! I (Brian Jeffery) published my first book when I was nineteen, in 1957. I had attended the King’s School Canterbury, I had safely in hand my Open Scholarship to Christ Church Oxford, and I had spent many hours during my last year at school in the Cathedral Library. I should explain that the King’s School is, I think, the oldest continuously functioning school in western Europe, having been the school of the monastery at Canterbury until Henry VIII disestablished the monastery in 1540, at which point the same boys and the same headmaster Mr Twine simply continued as they had before but now on the new Cathedral Foundation. I now spent six weeks in the summer of 1957 working in the Cathedral Library with William Urry the archivist and librarian, who later would become Reader in Medieval Palaeography in the University of Oxford, on the archives of that moment in the history of the School, and published the result as a book in September 1957 in a grand edition of three copies, of which I have one now, one is perhaps in the Cathedral Library, and I don’t know where the other one went to. Recently I made a set of photocopies of my copy and donated them to the School’s Archive. I therefore already knew that it is possible to publish one’s own book. Fast forward to five years later, 1962, when I finished my postgraduate thesis in musicology at Oxford on the composer Antony Holborne and then later offered it to the journal Musica Disciplina, who published it in its entirety, with no changes. Then to 1967 when I finished my doctoral thesis at St Andrews on French Renaissance comedy and offered it to Oxford University Press, who published it in its entirety as a book, with no changes. Many years later I met the man at OUP who had been in charge of producing that book and I told him how splendidly I thought that they had designed the book, and he said “Ah, we do not design our books, we merely print them” – by which I imagine that he meant that the books all followed the same design model. In fact he was being modest, because that book’s splendid design did indeed have some individual design elements which were evidently owed to someone, no doubt to him. 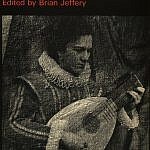 I was already playing the lute in concerts, and Oxford University Press Music Department asked me to prepare some editions of lute music arranged for guitar, which I did. Acceptable design by OUP. 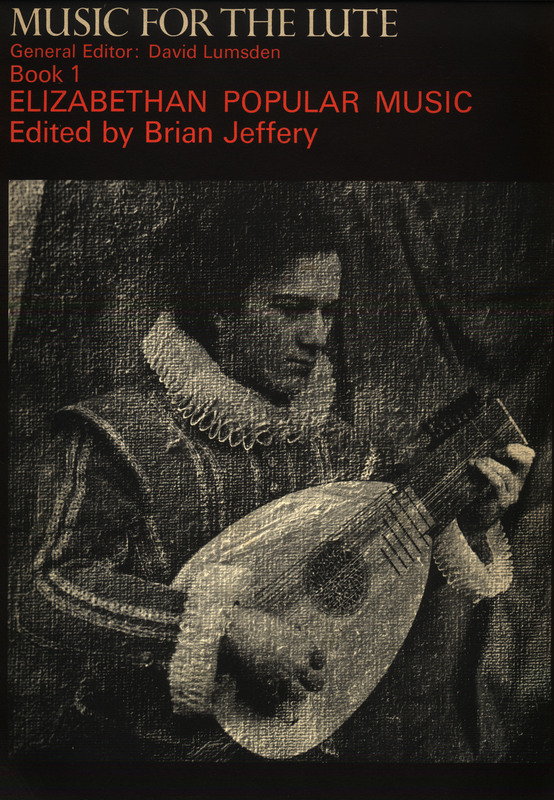 But in 1968 OUP Music Department published an edition of mine, Elizabethan Popular Music for the Lute, with a faked photograph on the cover, without consulting me and without even telling me in advance of publication. The edition, like all my editions, was conceived to provide a hundred-per-cent reliable text of the music without any of the fakery and changes made without saying so, that characterized – and still do – many other music editions. They had dressed an actor in Elizabethan costume, put a lute into his hands, photographed him, and then photoshopped the photo – in the days before Photoshop – to make it appear that it was a picture of a genuine tapestry, which it wasn’t. So this faked photo was in diametrical contradiction to what my edition stood for. I was not at all pleased. The problem was not just the cover, but the fact that this publisher, OUP Music, felt entitled to publish an edition of mine with an important design element without consulting me, or even telling me, first. Not good. But then at a dinner-party in London I met someone who said: “I have just published my own book! I don’t have to suffer publishers’ changes any more! I am able to choose the cover design, the font, the text design, even the paper!” I thought, that is for me. And it was then that I took control of my own publications. There were not going to be any more unacceptable changes by publishers. The next publication was entirely in my control. And it was a joy. The book was Chanson Verse of the Early Renaissance, a collection of the earliest known printed editions of French popular song-texts, dating from approximately 1515-1525. Back in the 19th and early 20th centuries there had been editions of the so-called Manuscrit de Bayeux and of the so-called ms 12744 which were manuscripts of fifteenth-century French popular songs with music; and now these tiny printed editions of song-texts from 1515-25 were another form of those same song-texts, this time without music, interesting in their own right. Having prepared the edition, instead of offering it to a publisher, I went to the Senate House Library in London and looked for recent books which in my opinion had been extremely well printed – not for their content, but for the names of their printers. I ended up with a list of about twelve extremely good printers. I wrote to all twelve asking for an estimate. By return of post came an estimate from Artes Gráficas Soler in Valencia, in Franco’s Spain, at a good price. Other estimates drifted in, some from UK printers months later. I accepted the estimate of Artes Gráficas Soler and posted the typescript to them, and they printed the edition, in English and in early sixteenth century French, at a wonderful quality, in 1971. I advertised it by sending out by post a leaflet in very black type printed on rice paper (you can’t do that with modern print techniques) and got very many orders and payments, and made a handsome profit. That first edition under my control, of 1971, was published under my own name, not Tecla. The name Tecla followed with the next publications, in 1976, when I was looking for a name for my new business. I was in Mexico City and some friends of mine had a teashop there called La Tecla which means The Key [on a keyboard] – a name which they had chosen because it covered both the writers (with their typewriter keyboard) and the musicians (with their music keyboard) who haunted that café. I asked them if I might be allowed to use the name for my new publishing house, and they said yes. 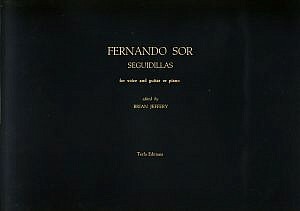 Those first Tecla Editions publications in 1976 were the first edition of my book Fernando Sor Composer and Guitarist, the first facsimile edition of the Complete Works for Guitar of Sor, and the first printing of the Seguidillas of Sor. As everyone knows, in later years followed the new re-engraved edition of the New Complete Works for Guitar of Sor, my edition of all the Beethoven piano sonatas (which I consider that it would be irresponsible for any professional pianist not to use), the Complete Works of Giuliani, and many other books and editions. In 2000 Tecla was joined by its online sister Hebe, which was one of the first websites to offer online files for sale (digital downloads). In 2017 was published my book España de la guerra: the Spanish political and military songs of the war in Spain 1808 to 1814, a study of the mechanisms of propaganda in the war in Spain of 1808 to 1814 with special reference to the songs in that propaganda, a subject which has never been described before. And I am delighted to say that the printers of this new 2017 book are Artes Gráficas Soler, the same firm as back in 1971. They are the oldest firm of any kind in continuous existence in Valencia. In the year 2021 we will celebrate fifty years of association and we already have events planned for that celebration. Tuesday 13 February 2018 is the 240th anniversary of Sor’s birth on 13 February 1778. To celebrate it, we are putting some special offers on the Tecla site. The first review of my new book “España de la guerra” is out! in the guitar magazine Il Fronimo of Milan of January 2018. I’m happy to say that the reviewer, Danilo Profumo, liked it, and I’m happy to say that he emphasizes the political and historical context in which the songs existed and in which – as he says – the guitar played its part. He mentions, of course, the role that Fernando Sor played, with his six known songs of this type. 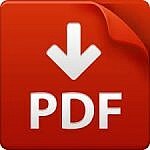 All the Sor pieces and Carcassi etudes, and the Giuliani Sonatina, that are prescribed for the Associated Board (ABRSM) guitar exams at all grades are now available individually, as inexpensive pdfs on the Tecla site. All of them are fully reliable newly made Tecla editions, all authentic, all fully acceptable by the Board. Have a look! Click here to view the list. I’m delighted to announce here the forthcoming concert of Gabriella Di Laccio (soprano) and Jamie Akers (guitar) at Burgh House in Hampstead, London, UK, on Wednesday 18 October 2017 at 19.00. Gabriella will sing some seguidillas by Sor from my edition of Sor’s Seguidillas, and some songs by Giuliani from my editions of the Sei Ariette and Sei Cavatine of Giuliani. I will be there and I will have copies of those Tecla editions with me if anyone would like to see them. It will be an exceptional evening and I really recommend going, if you will be in London on that day. The Burgh House webpage about the concert is here. You can get tickets here (or on the door on the night but the hall isn’t very big so it might be advisable to get tickets in advance). You can hear some splendid extracts from their recent CD of this music here. The Tecla edition of the Seguidillas of Sor in paperback, which had sold out, has now been reprinted and is again available from tecla.com.